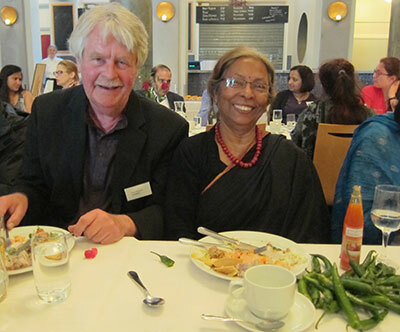 On 20–22 May 2015, SASNET/Lund University successfully organised an international conference on ”South Asia in Transformation: World of Slums, Global Power Houses or Utopias? ”, with a sub-title ”Migration, Labour, and Family Changes in a Dynamic Region”. 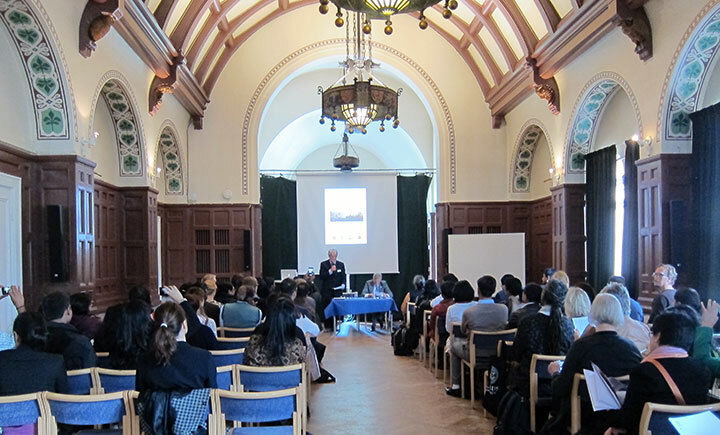 The three-day conference, generously funded by the Crafoord Foundation, Forte and the Swedish Research Council, was held in Lund. 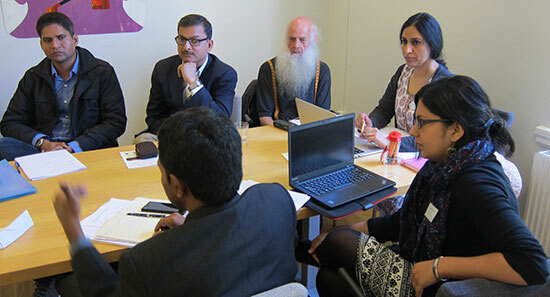 More than 70 researchers from Europe and South Asia turned up for theconference that consisted of seven panels, each one led by eminent researchers. The theme of the panels varied from ”Urbanization and Social Sustainability”, to ”Ethnicity, Religion and Changing Caste Relations”, ”Changes in Family and Household”, ”Migration, Environment and Social Sustainability”, ”Governance in South Asia”; ”Changing Labour Markets”and ”Structural Transformation and Social Conflicts”. The conference had managed to attract four eminent keynote speakers, namely Prof. Abram de Swaan from University of Amsterdam; Prof. Rajni Palriwala from University of Delhi (the two of them on the photo to the right); Prof. Gita Sen from Indian Institute of Management, Bangalore; and Prof. Ruth Kattumuri from London School of Economics. 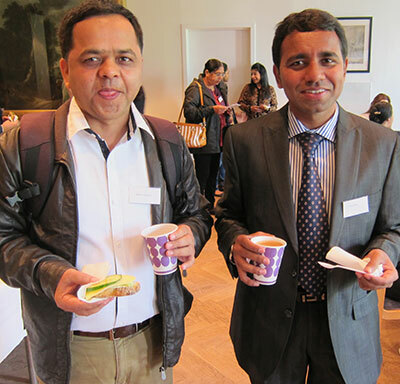 The networking was intense with a large continent of young, promising researchers from South Asia – India, Pakistan, Bangladesh, Nepal, Sri Lanka and Afghanistan – presenting their papers along with Scandinavian colleagues. 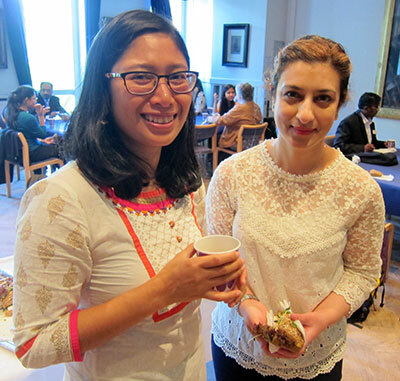 SASNET had given travel grants to no less than 30 young South Asian researchers. The conference aimed to explore the impact of the on-going structural transformation in South Asia, in which large sections of the population are gradually moving from the agricultural sector into other sectors of the economy and/or geographical areas, mainly urban areas. These processes include urbanization, the growth of a new middle class, and increasing national and transnational migration. 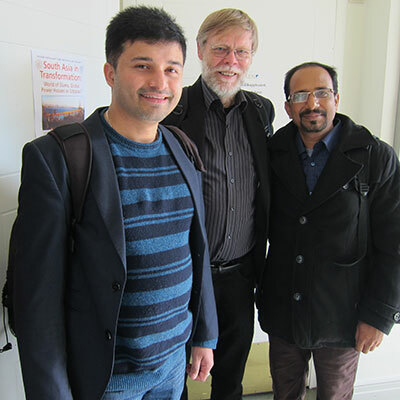 The purpose of the conference was to explore the social consequences of the transformation of South Asian societies (and by implication, the world). Structural transformations produce new opportunities and risks as job possibilities and wealth are created and redistributed unevenly. This may lead to the marginalization of some groups as well as social conflicts. The aim of this conference was also to map the social impact of South Asia’s structural transformation so far, with specific reference to changes in labour migration patterns and in the composition of the care economy of families and households. Each of these aspects is often studied in isolation despite the fact that they are deeply interrelated. Furthermore, the conference explored interrelated social and economic aspects of sustainability simultaneously and targeted a process whose outcomes will be felt across the world, given the sheer population size of South Asia. For global sustainability purposes, it is crucial to map the current state of affairs and explore different development possibilities and scenarios for this region. Papers that compared South Asia with other regions were encouraged. 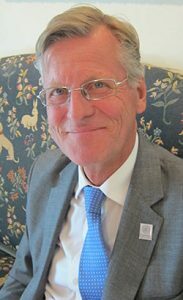 The conference was introduced by SASNET acting director Lars Eklund, after which Jonas Hafström, the newly appointed Chair of the Board of Lund University, held an inspired inaugural speech. 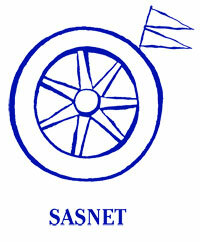 See a recording of the opening cermony of the 2015 SASNET Conference. 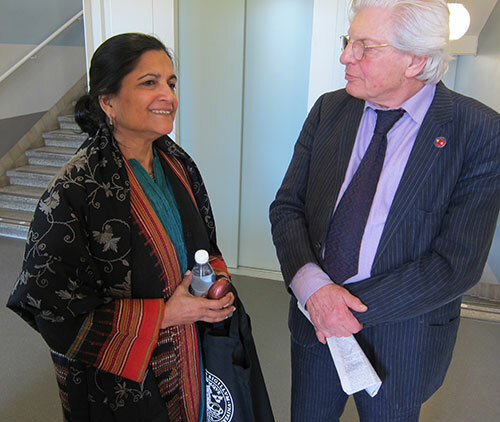 Professor Gita Sen – photo to the right – from the Indian Institute of Management, Bangalore, India (and Harvard School of Public Health, Harvard University) was the first keynote speaker, giving an appreciated presentation, entitled ”Social inequality as a barrier to growth and poverty reduction: South Asian dilemmas”. 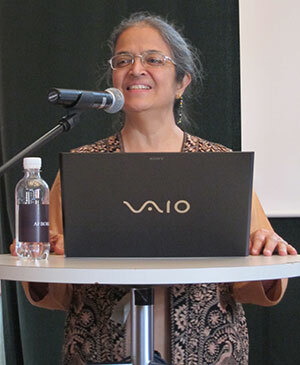 See Gita Sen’s lecture youtube version, recorded by Talat Bhat. The keynotes took place at the Academic Union Building (AF) whereas the panel sesssions all took place at the Dept.of Sociology, 10 minutes walk away. Seven parallell sessions were held divided into five slots in three days. Most papers are available to download, go to the respective panel page. Panel Chair: Mashiur Rahman, University of Dhaka, Bangladesh. 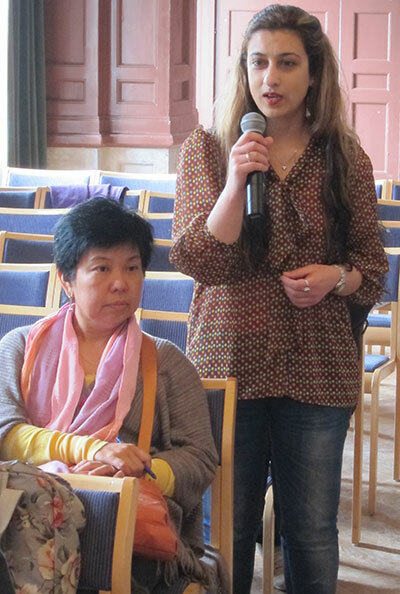 Rajni Palriwala and Gita Sen.
On Day 1, Wednesday 20th May, a second keynote lecture was held in late afternoon. 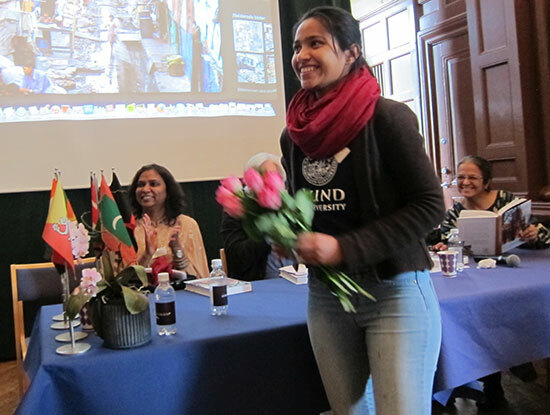 This time it was Professor Rajni Palriwala from University of Delhi who spoke about ”Trajectories of Desire: Reflections on Marriage, Social Change and the State in India”. Being a public lecture it also attracted many people from outside the conference. See the lecture youtube version, recorded by Talat Bhat. Then followed an optional guided tour of Lund city with Lars Lundberg, renowned for his entertaining but still true to facts way of presenting history. 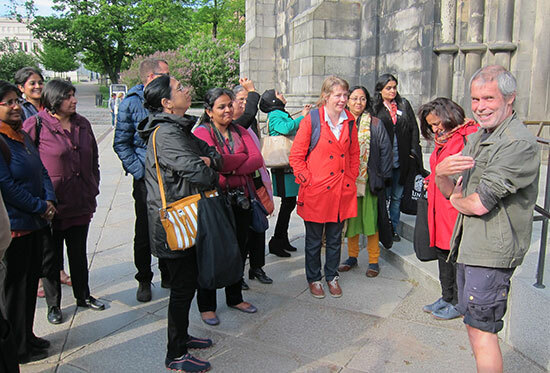 In the nice sunny weather, Lars brought the 40-odd people who turned up outside the Cathedral, for a walk in historical quarters centred around the Lundagård park. Ending bythe University main building, the White House, Lars Eklund made a complimentary visit to the Concocation Hall inside the university building possible. 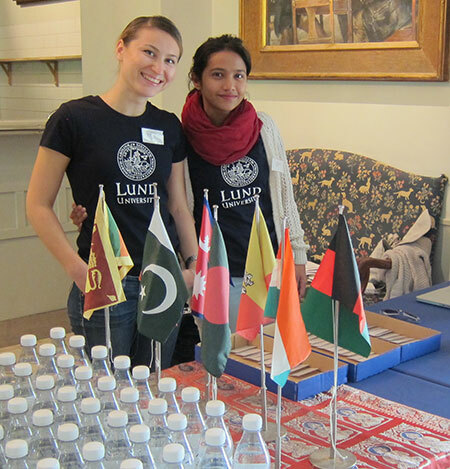 Carin Brenner, Chief of Protocol Officer at Lund University, happened to pass by and being an old aquaintance of Lars, she was kind enough to open up the auditorium, with its wonderful interior, popular to photograph for the South Asian visitors. Thursday morning started with yet another keynote presentation, this time by legendary Professor Abram de Swaan from University of Amsterdam. He spoke about ”Are Poor People Enough of a Nuisance? Changing Elite Perceptions of the Poor on the National and the Global Scale”, and met a receptive audience in a crowded hall. Staffan Lindberg moderating the final roundtable, with Ruth Kattumuri and Abram de Swaan. 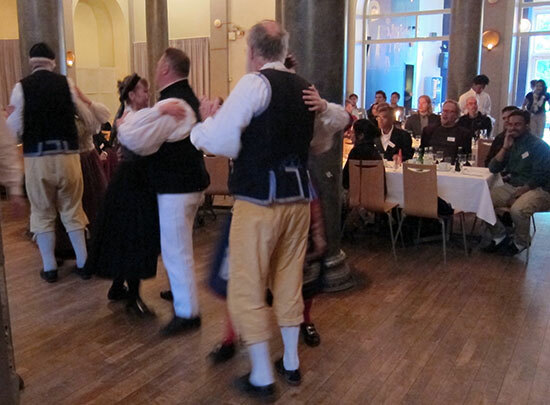 The rest of Thursday was then devoted to panels, and most of them were actually finished by evening, well in time for the gala dinner at Tegnérs Restaurant. 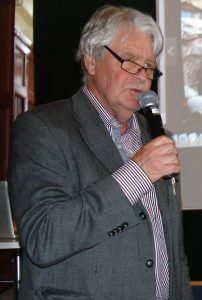 The programme for the final day, Friday 22nd May, also started with a keynote presentation, by Professor. Ruth Kattumuri from London School of Economics. She spoke about ”Two dollars-a-day Population and Love’s Labour’s Gained”, a presentation filled with statistical information about India. 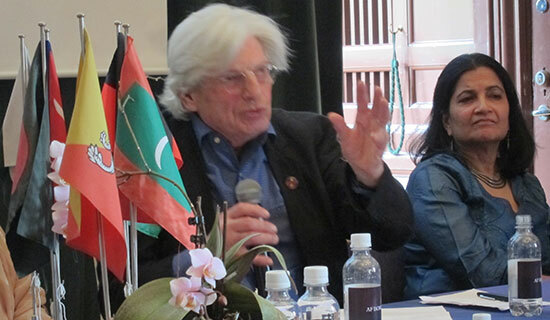 After her presentation the stage was opened for all the four keynote presenters, for an interesting round table discussion, moderated by former SASNET director, Professor Staffan Lindberg, Lund University. Besides their conversation, Staffan also invited representatives of the seven panels that had been held, for them to summarize the results of each panel. Finally, the conferece convener Lars Eklund thanked the keynote speakers, the panel chair persons, the steering committee planning for this conferece for more than a year – Anna Lindberg, Olle Frödin, Andreas Johansson, Lubna Hawwa and Jacco Visser – and the five student assistants (Rubana Musharrat, Maria Jäppinen, Sixten Lundqvist, Liz Kiziukiewicz and Phu Doma Lama) that made the smooth functioning of the conference possible. 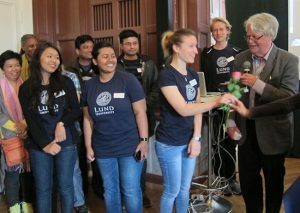 They were all given gifts to remember Lund University and the successful conference being held. 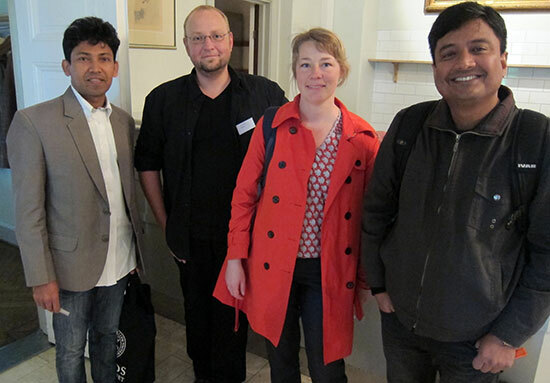 Meah Mostafiz, Kenneth Nielsen, Karina Standal, and Mashiur Rahman. Alin Kadfak and Sheba Saeed. 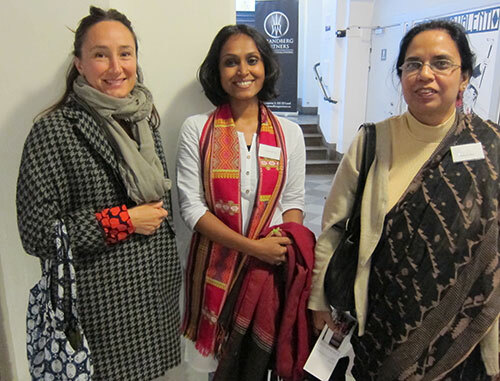 Panel 4 on Gender and Governance in South Asia, led by J Devika and Malin Jordal. 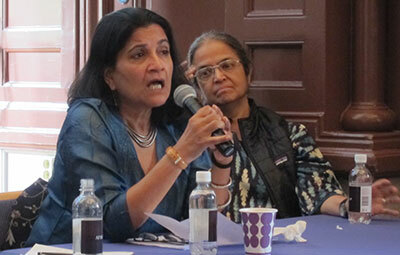 Panel 5 on Ethnicity, Religion and Changing Caste Relations, led by Ravinder Kaur and Winnie Bothe. Chairs of the seven panels being felicitated after the conference by Lars Eklund. 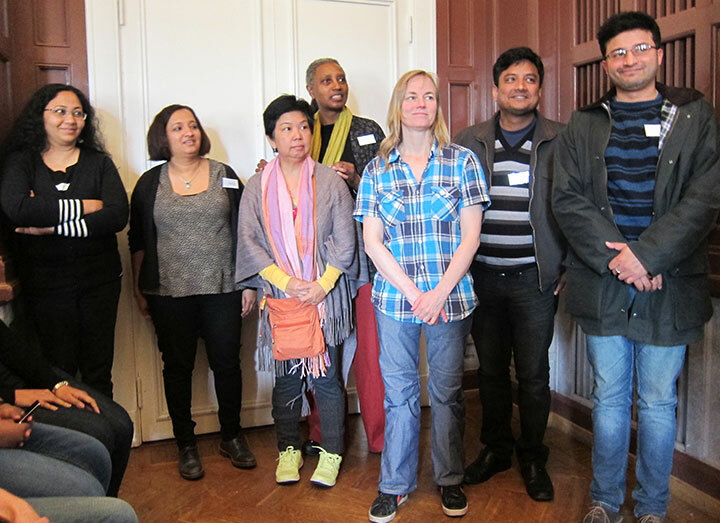 Devika, Vandana Desai, Chona Echavez, Linda Lane, Winnie Bothe, Mashiur Rahman and Debojyoti Das. 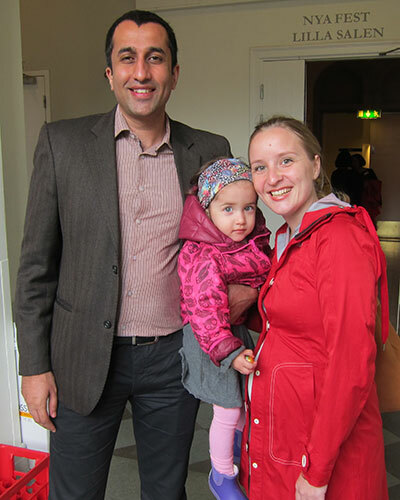 Kenneth Nielsen, Patrik Oskarsson, Malin Jordal and Ravinder Kaur had already left. Maytreyi Choudhury, North Bengal University, Siliguri, at Paradisgatan near to the conference venues. Appreciated guided tour around central parts of Lund, led by Lars Lundberg. Lubna Hawwa from the conference steering committee. 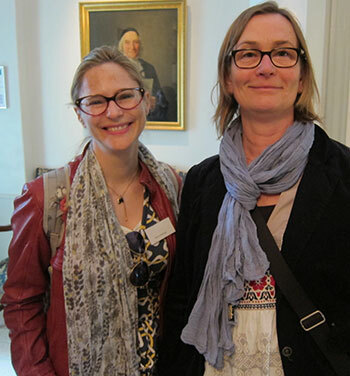 Thanks to Maria Jäppinen and the other student assistants.